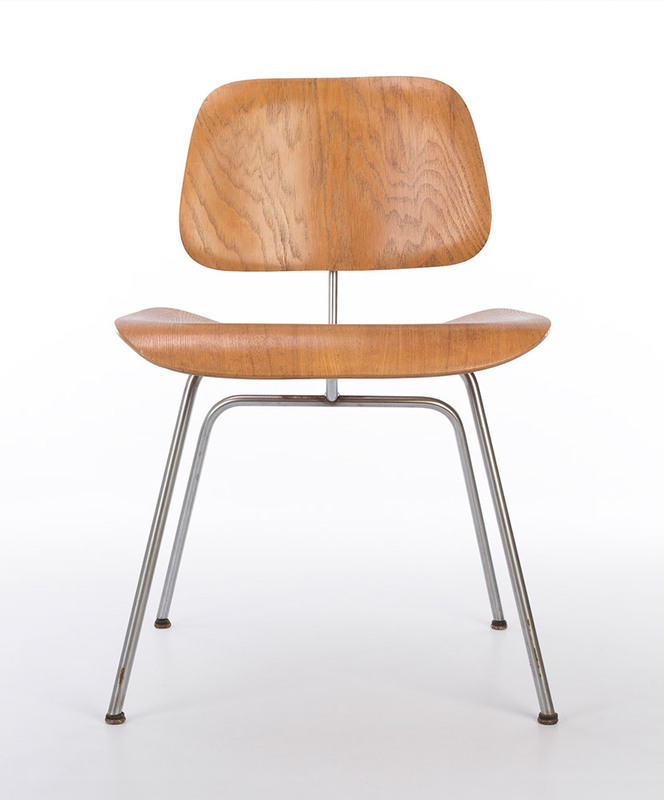 What is the Eames plywood DCM side chair? The 1946 Eames DCM Chair was the abbreviated name representing the Dining Height (D) Side Chair (C) on Metal (M) Rod Base. 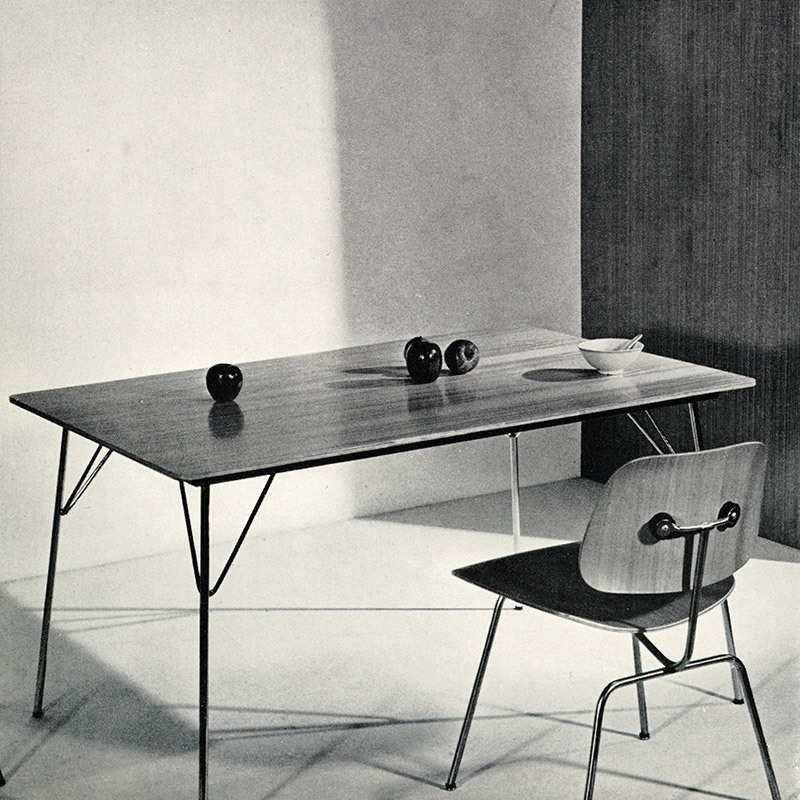 The chair was part of a small series of chairs and tables which effectively kick started the career of Charles and Ray Eames into notoriety. 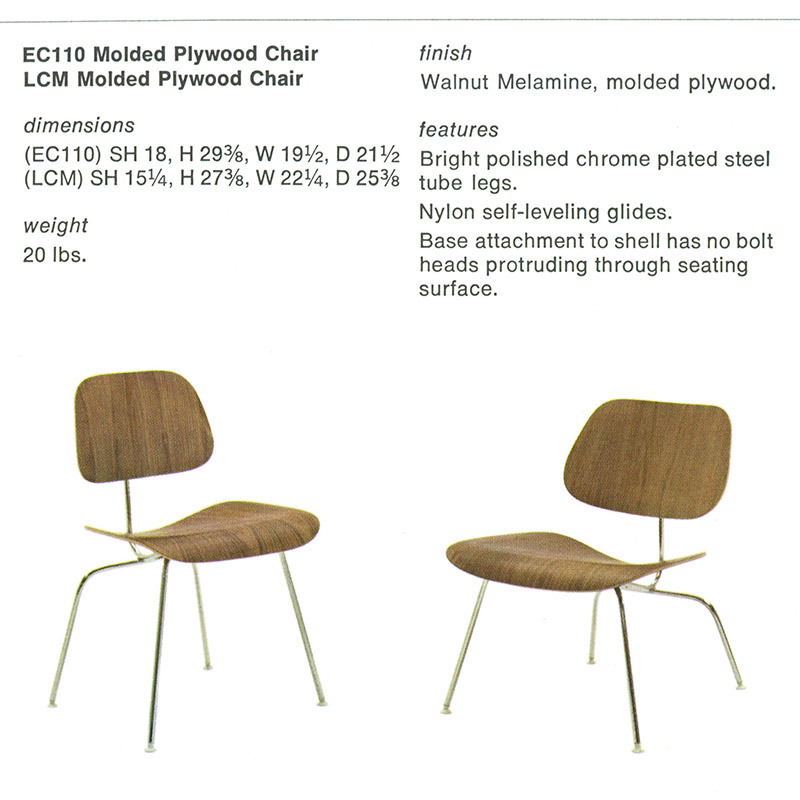 History would soon coin the phrase ‘Eames Chairs’ largely based on the design and success of the first group of chairs including the DCM alongside the lounge version LCM as well as the wooden leg versions the DCW and LCW. 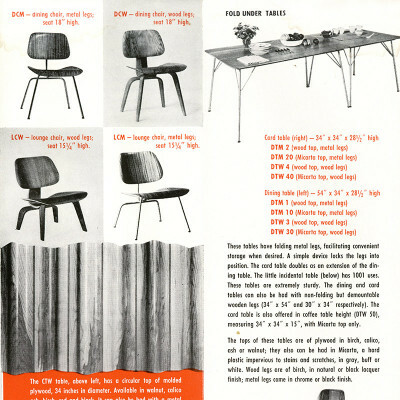 The series were a result of a long-standing collaboration between Charles Eames and the Evans Plywood Company which had worked together, from the same location in Venice CA, throughout the war years. The design of the series may seem classical and relatively tame by today’s standards but imagine the post war period from 1946 when designs of new materials and shapes were beginning to reach the public domain. They were perhaps a pre-cursor of the decade to come which had an almost unlimited feel of expression in US design, the 1950’s. 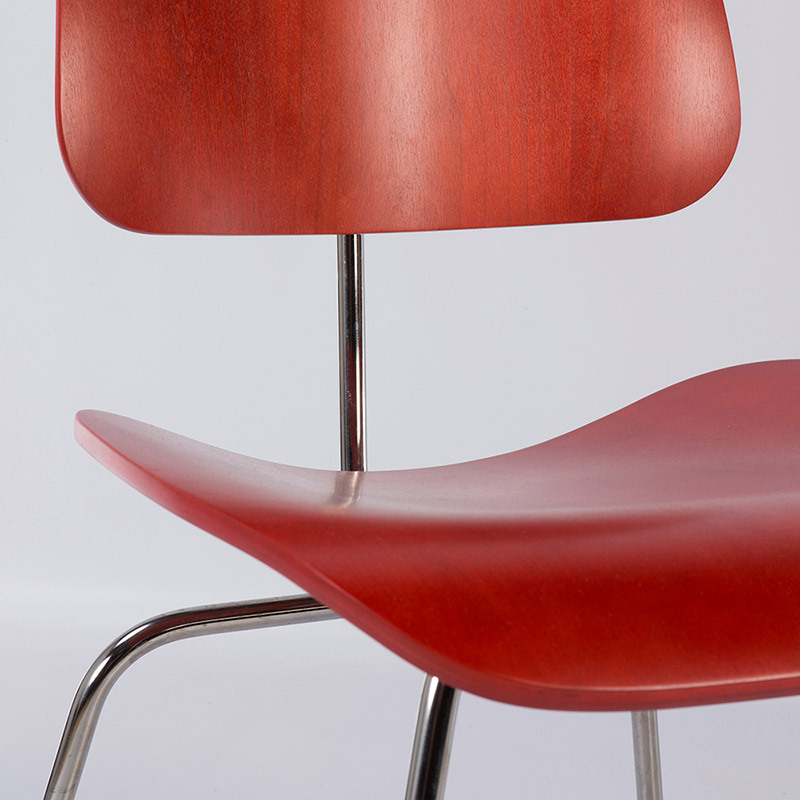 The Eames DCM Plywood Chair would be made available in a range of plywood veneer woods and colours. 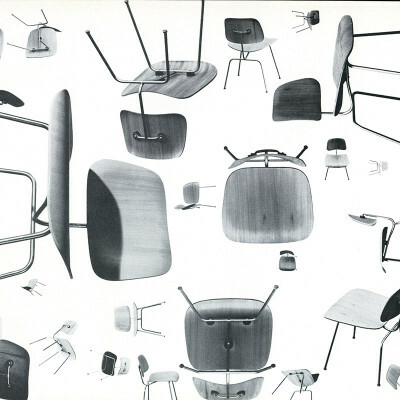 Herman Miller, whom had been involved in the distribution of the chairs for Evans Plywood Division, purchased the manufacturing operation and all licenses in 1949, literally paving the way for one of the design worlds most potent partnerships. 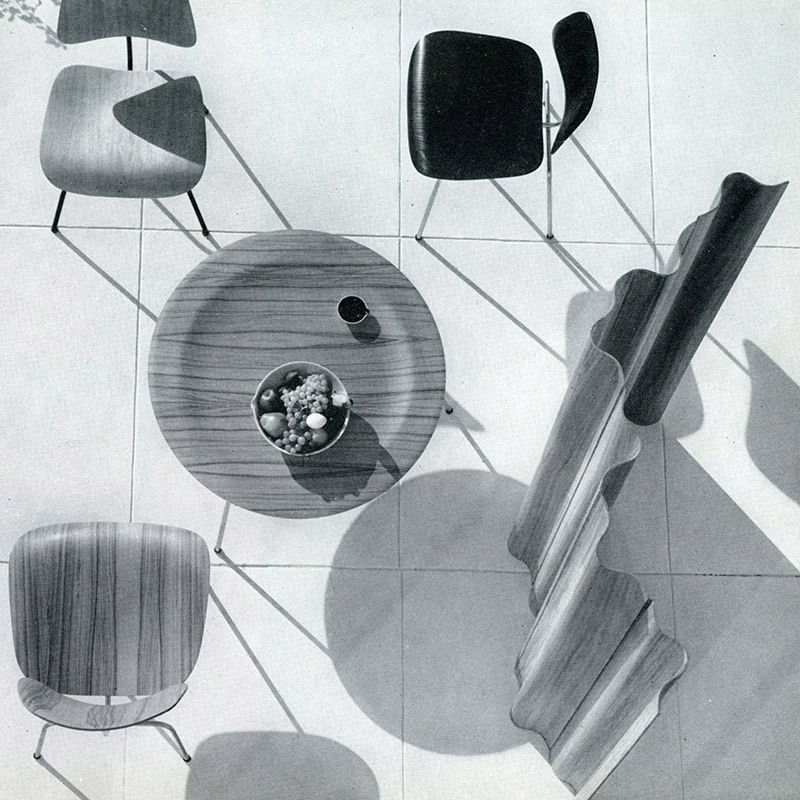 Such was the popularity of the DCM and lounger LCM version, they have remained on the Herman Miller catalog to this day whereas most of the plywood furniture items were obsolete before the end of the 50’s. 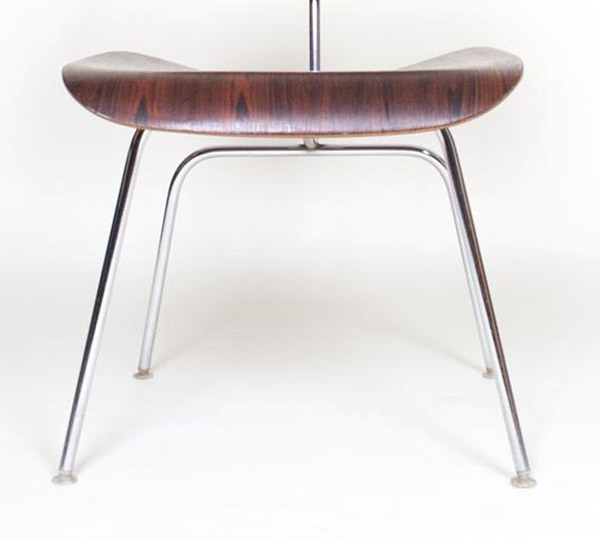 As well as the natural wooden versions, upholstered variants were also made through the generations. What are the original sizes of the plywood DCM side chair? Generations were rarely predefined or premeditated, they were more often than not a natural evolution of the product or transition of what was available. It is human instinct to pigeon hole to help define what we own but it was doubtlessly unintended. Our interpretation of generations is only to help collectors, buyers and sellers to verify, date and value what they have. We only focus on marketed versions and not prototypes. 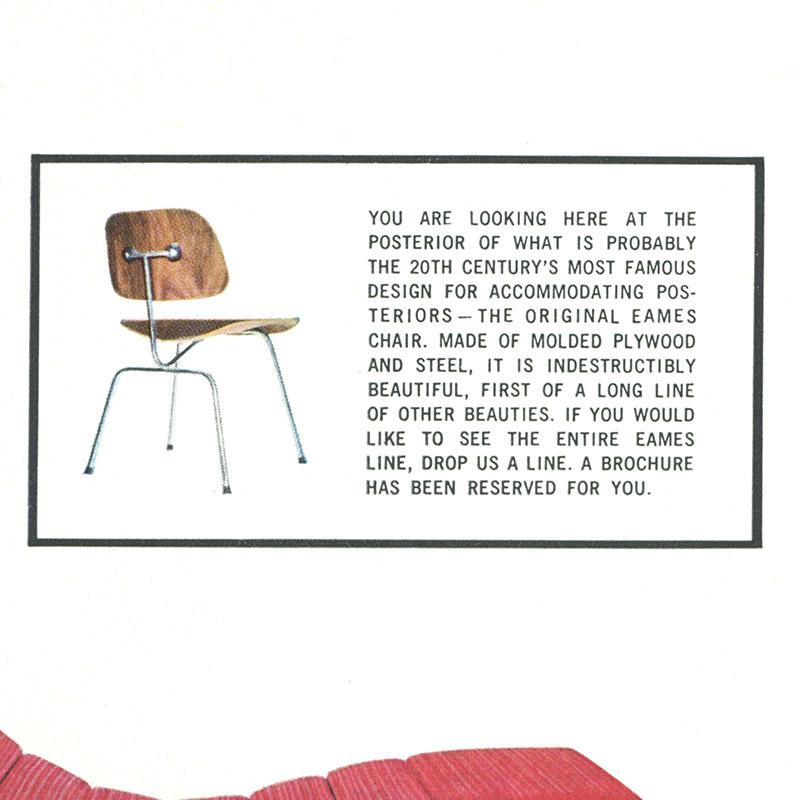 The easiest way to determine the 1st generation is to look out for a Label From the Evans Plywood Company. If there is no label then the metal frame of the chair is the best location to view. Look at the back section that attaches to the backrest part of the chair. 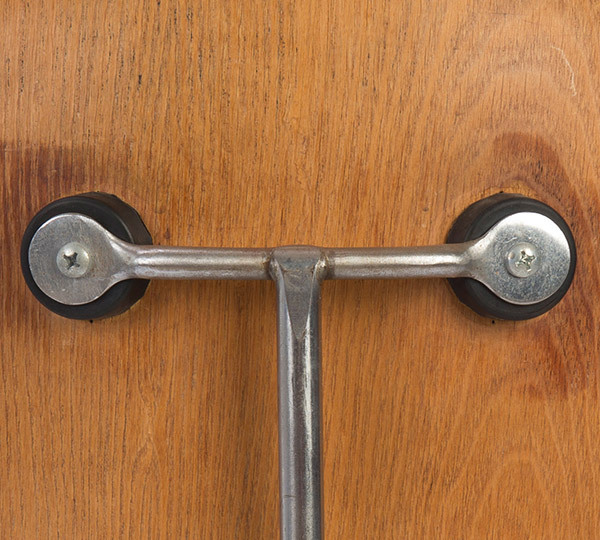 The first generation frames always have circular attachment points. The early first generation labels include the Evans Medal, Medal Strip, Paper and foil labels. The frames were available in Black or Zinc plating. 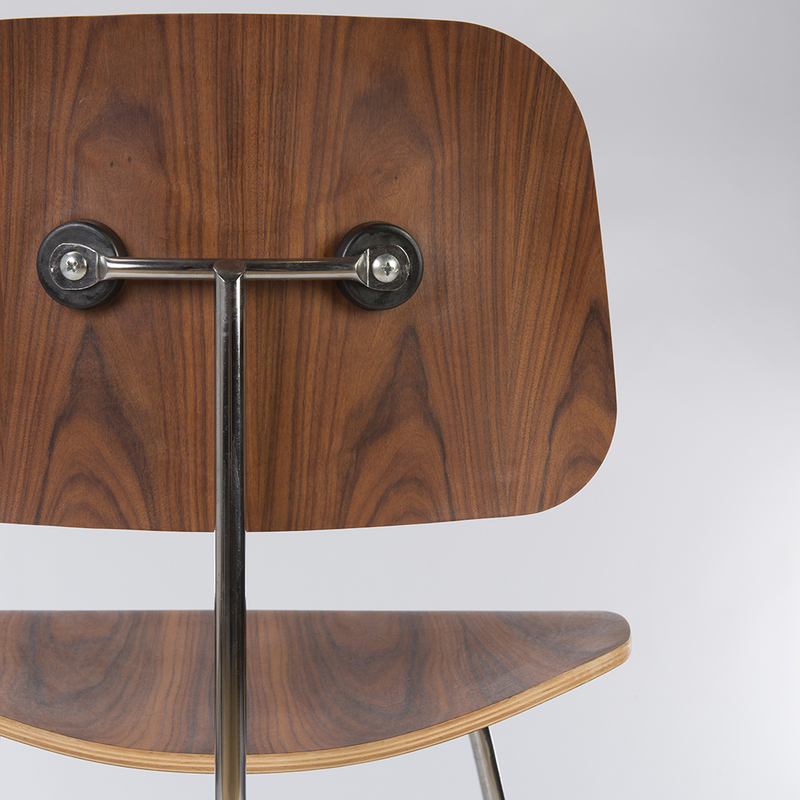 The shock mounts were thicker than those found on recent models or shell chairs. 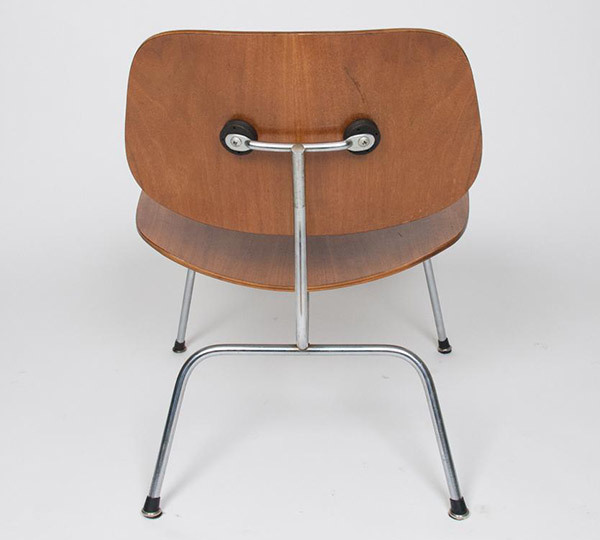 Look at the backrest connectors and note the round connectors have been reshaped to an oval and where the spine joins is no longer tapered. The shock mounts that HM used also had 4 holes punched into them which are visible. The feet of the chair remains the domes of silence and the frame remains as solid cast. 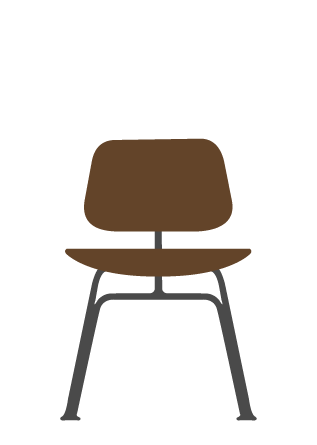 The third generation (2nd Herman Miller Gen) only consists of a change of feet. 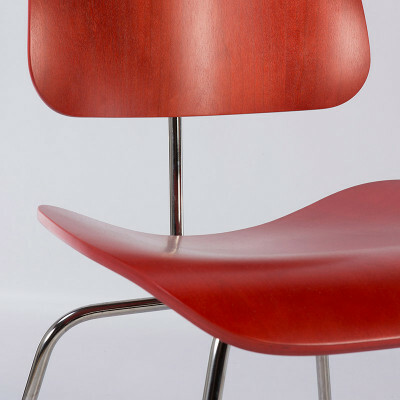 The domes of silence are replaced with the rubber and alu boot glides that push onto the leg. Everything remains the same, same connectors, same solid frame, same shock mounts with 4 holes. 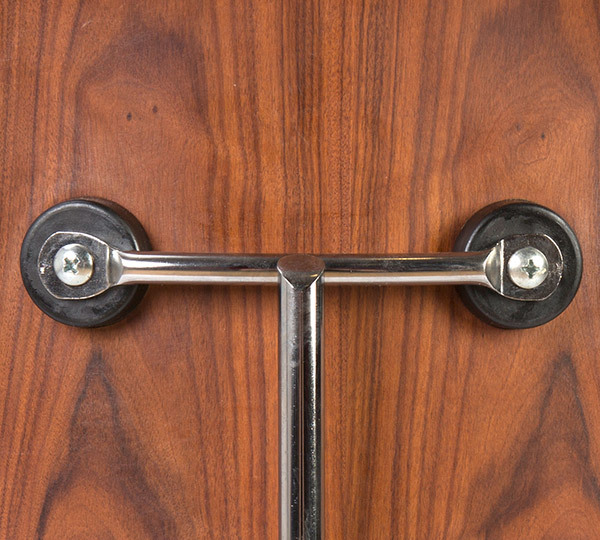 Differing wood types also become available including Rosewood. 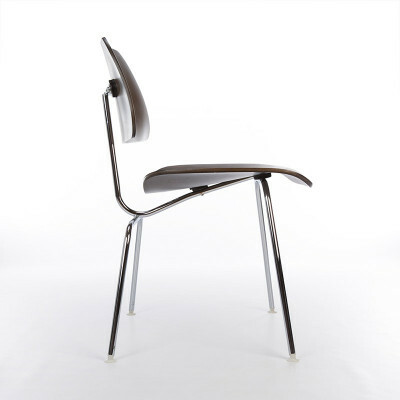 The fourth generation (3rd Herman Miller Gen) involved a changing of the metal frame and the feet once again. The boot glides of the previous years didn't turn out to be a long term solution due to them falling off and splitting. 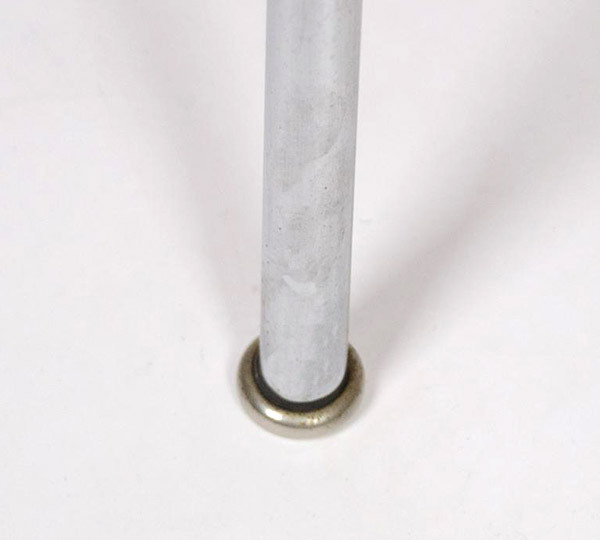 New nylon glides were constructed with a metal insert that fitted so tightly into a new lighter tube (no longer solid) leg they are extremely hard to remove. The shockmounts remained large but lost the 4 punch holes. The fifth generation (4th Herman Miller Gen) saw a change in the shock mounts. 6th & current gen with smaller oval connectors and cut in frame ends. Is my Eames DCM Plywood side chair real? What makes it valuable? 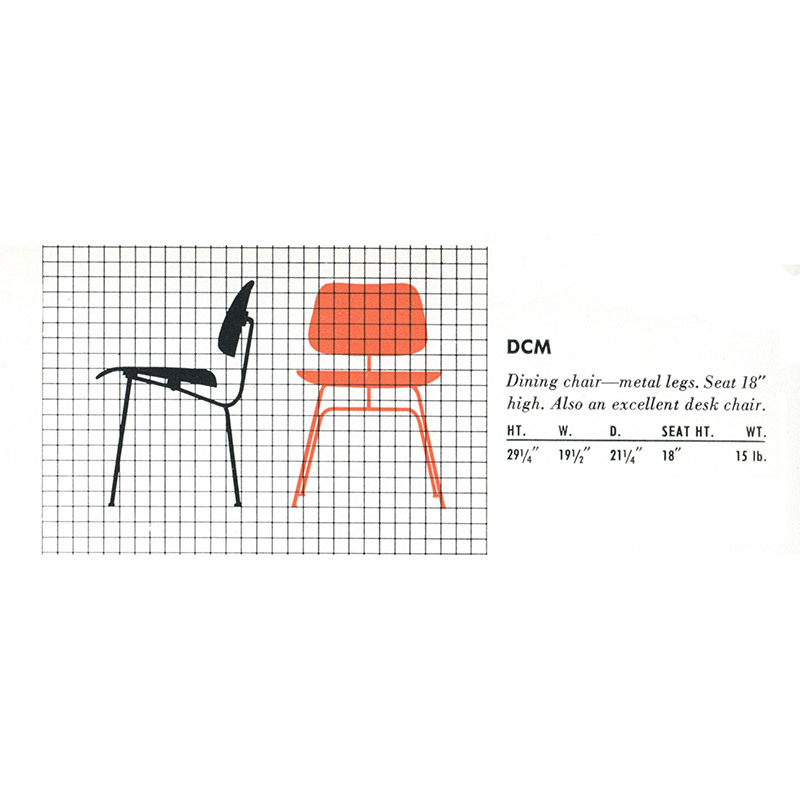 The DCM has been in non stop production since 1946 and therefore will have a full range of labels and stamps to help with authenticity, if they are still present. 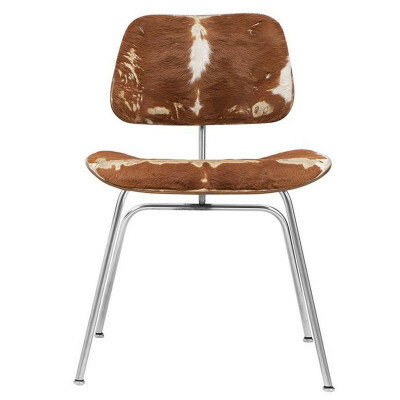 Our generations section will help you to recognize an authentic chair and age it accordingly as well. 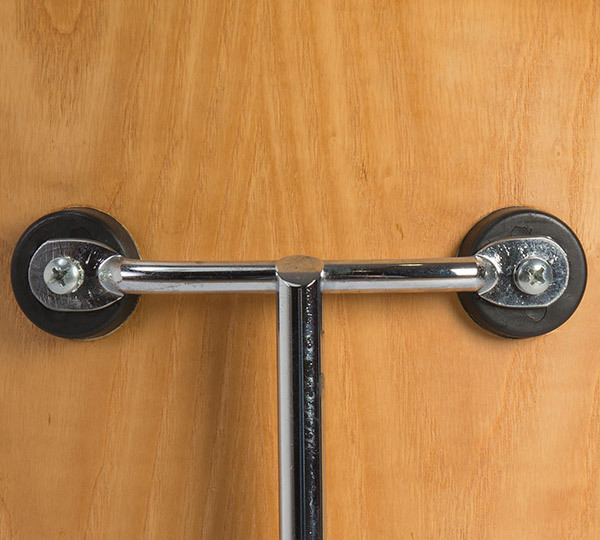 Look out for clear ageing on the frame, remember they were available in zinc plate or black. Early examples too were solid cast and very heavy. 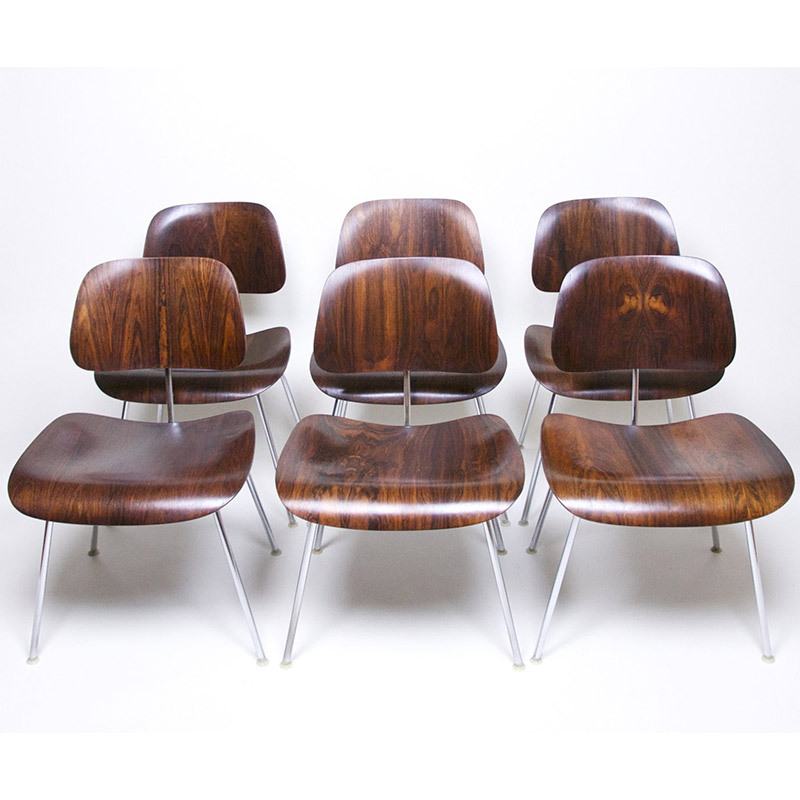 Modern repros tend to be light chrome and in cheap oaks or ash. 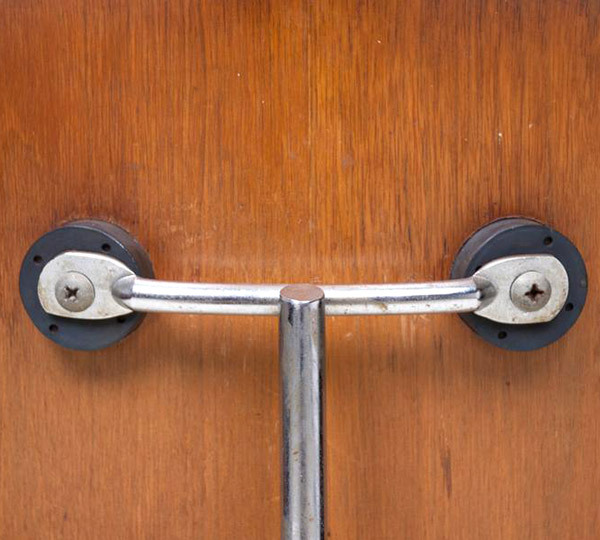 They can rust and pitt in places, especially joints, this helps authenticate. 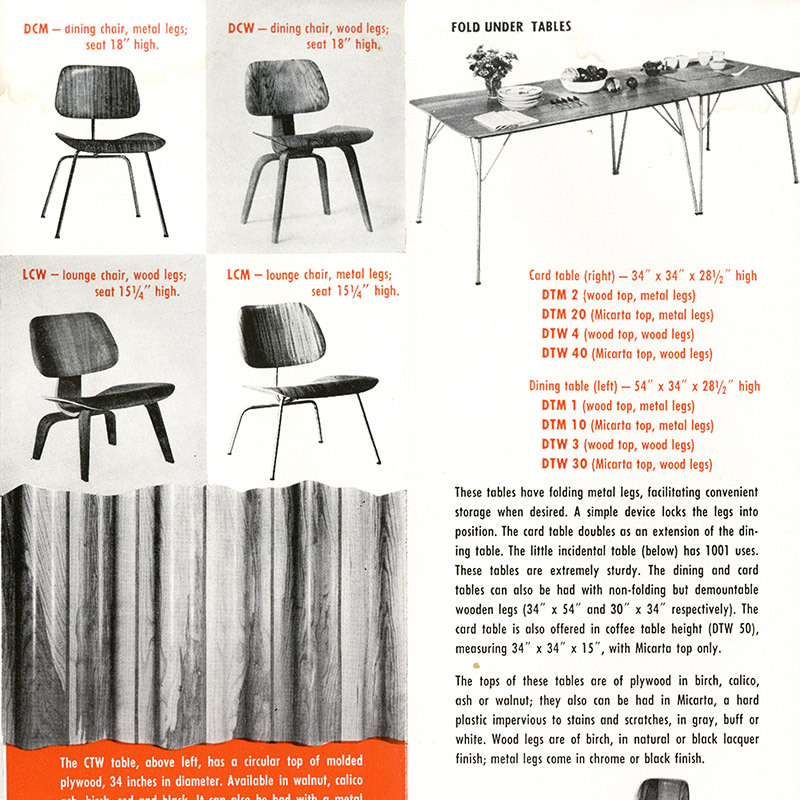 The ply thickness is 5 ply, anything else is not authentic. Remember that DCM's used thick mounts right upto the 90's and repros tend to mainly utilize thinner modern mount copies. 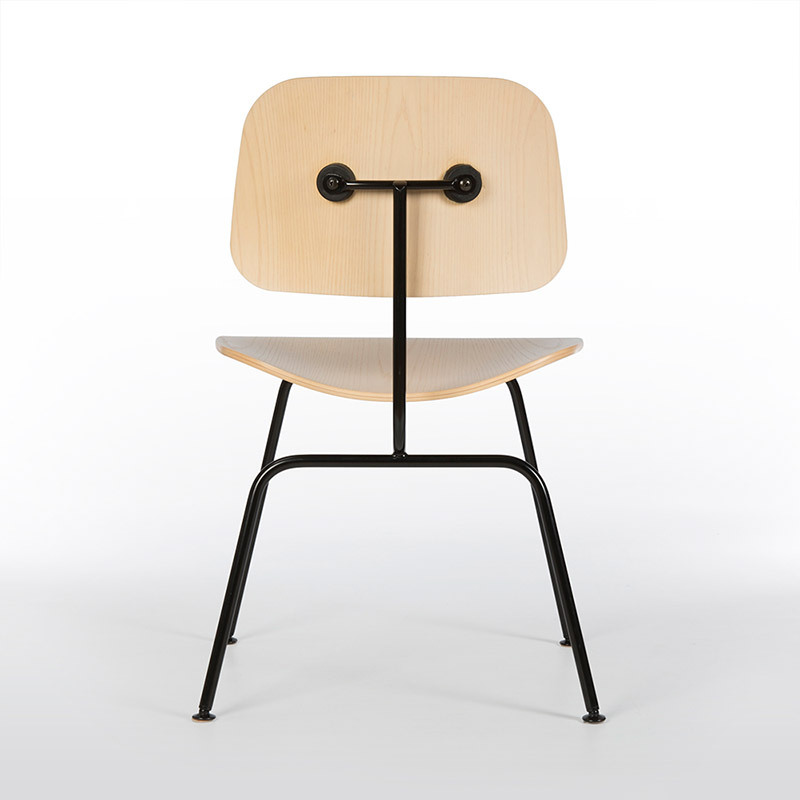 Older generation versions (Evans and 1st gen HM) often have written or stamped abbreviations of the chair code, most likely from assembly, this helps to authenticate too if present. 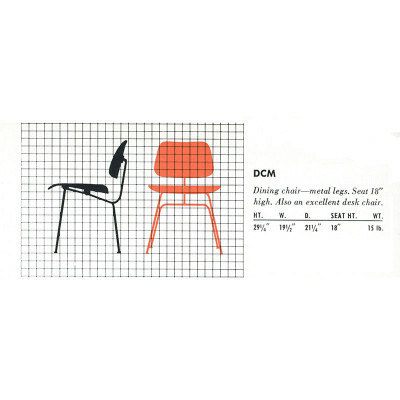 Value of the DCM is generally governed by the age and the rarity of the wood, label and upholstery, if it exists. 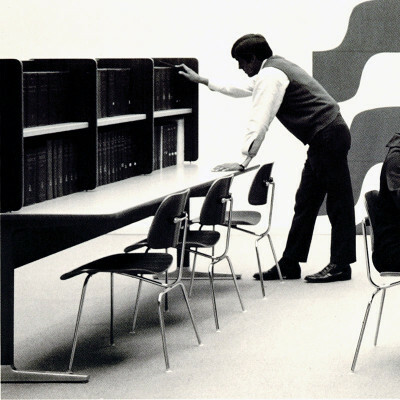 The early Evans versions hold the highest desirability and indeed value. This is made more so if the label is fully intact. In the later 50's the Rosewood versions were released and these command a high desirability value as they were moderately rare and far more expensive at the time. 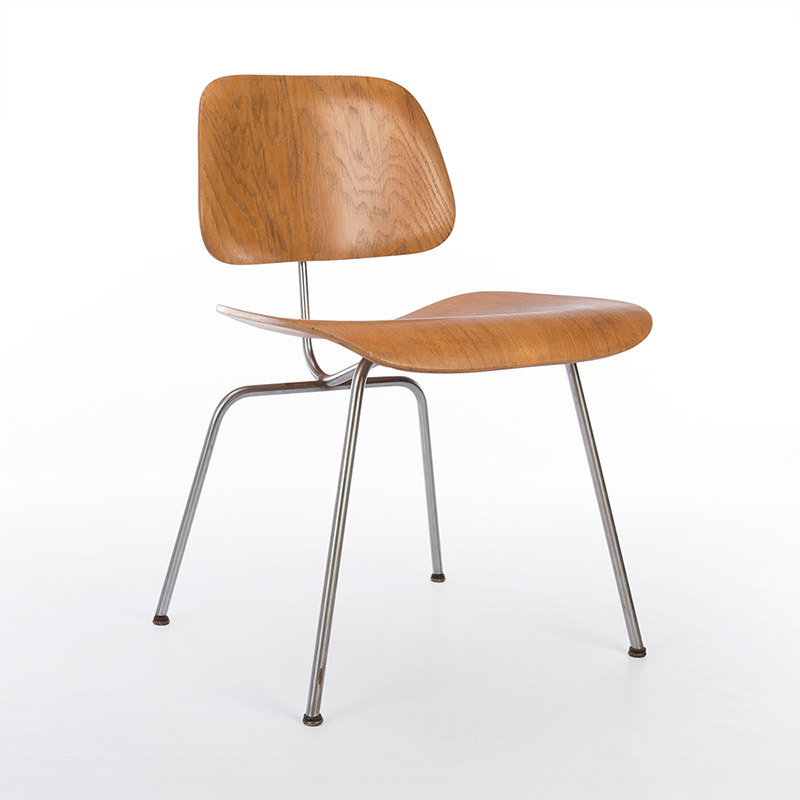 Early upholstered versions also fetch great secondary prices. Those in leather, slunk skin (Calf Skin) especially. 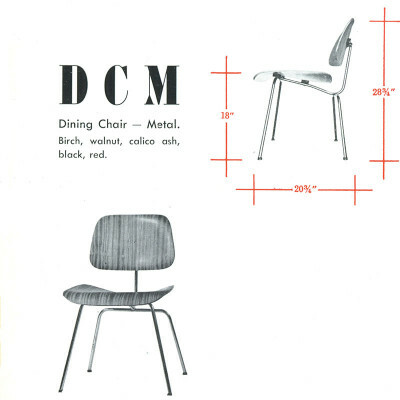 The DCM also came in early aniline dye colors and painted colors in recent years. Black and red dye early versions are much rarer than the the Birch and Calico Ash versions. Check all the edges for damage or chips in the ply as they affect value and pull on the mounts to see how well they are still fixed.